Part of what I want to tell you is what it is like to be young in New York, how six months can become eight years with the deceptive ease of a film dissolve, for that is how those years appear to me now, in a long sequence of sentimental dissolves and old-fashioned trick shots—the Seagram Building fountains dissolve into snowflakes, I enter a revolving door at twenty and come out a good deal older, and on a different street. But most particularly I want to explain to you, and in the process perhaps to myself, why I no longer live in New York. It is often said that New York is a city for only the very rich and the very poor. It is less often said that New York is also, at least for those of us who came there from somewhere else, a city only for the very young. this is still one of the most beautifully written essays i have ever read about coming-of-age and New York. i'm finding myself in a Didion sort of mood this season, sartorially and otherwise. for fall, i'm drawn to the feminine details that offer a nice counterpoint to my usual tomboy-ish essentials. the key jackets and coats are mostly covered in my wardrobe, which leaves some room now for the other layers. already crossed off the list are the Acne scarf and Manolo heels (they are truly perfection on a stiletto). i had been looking for an oversized, silky soft grey wool scarf for ages, and Acne makes the perfect version of this in a cozy and completely non-itchy lambswool. i'm still holding out for a PS1, though now i'm leaning towards the suede version. this might go on for a while...we'll see if i end up getting it. and last but not least, i can't resist a little leather mini (kookai does a nice one too). it's just short enough and leather enough, and i don't think you have to be very young to wear one! what's on your fall wishlist this year? Why have I never read Joan Didion before? I have a couple of her books on my "to read" shelf (yes, I have a shelf with books waiting for me to read them - it's a sickness), but have never committed to reading one. This post has inspired me to pull down her book of essays and start reading it tonight. Oh, and the clothes are very nice, too. ;-) Gotta love the PS1. It's becoming the new classic, no? This brown suede one in particular is very reminiscent of autumn and that back-to-school feeling. i have been perenially on the fence about the PS1 - as PPP commented below, there've been some very mixed reviews, sigh! My lifestyle is very casual and my fall wishlist is small this year. I will be purchasing 3 or 4 jewel toned or brightly colored cashmere sweaters and some new flat black boots. I really stick to a small curated wardrobe and add only a few special pieces per season. that's really cool that you've got such a shortlist and stick to it :) where do you get your cashmere knits? My go to for cashmere has been J. Crew for the incredible range of colors. I may try Garnet Hill this year. Frye boots, always. "Goodbye to all that" is the quintessential New York coming of age story and Joan Didion's writing is just so inspiring. I've been feeling her too. No one does that slouch like her! I love my Charvet shirts and can't wait for it to get cooler to break them out again! And speaking of leather skirts I keep eyeing The Row leather pencil skirt- it's just so polished but still has some sass. indeed. i am convinced that she was decades ahead as an unofficial spokeswoman / muse for James Perse's entire line. you have a H Kelly and a SC LV bag, a PS1 is pretty beneath you ;P Plus at the end of the day the Kelly and SC bag are simple and discreet designs. Where the PS1 is very “IT” bag. I like the croco leather mini you picked out (but I am biased), cream waffle sweater, and blue shirt with white collar. For me fall is a non-existent season, so I buy clothes to wear year round. I’m casually eying a few things, but I’m too broke right now. And I’ve already bought 22 out of 25 items for the year!!! the croco leather mini is pretty rad, eh? i can't believe i've ignored a leather mini for so long. SUCH a versatile piece. -ps. I've also read not too good things quality wise w/ the ps1 ones: http://emptyemptor.com/?p=2229 and on another blog, can't remember the name something with owls and then she had her own solo blog too. I remember reading how the leather completely changed colors on the outer parts. I'm sorry but I find it so pretentious to say a "ps1 is beneath you." Since when are clothes and accessories beneath someone? I own SEVERAL Hermes bags but I love the SC and the PS1 and hardly think it's beneath me. In fact I recently purchased both. They fit different needs. I've been lately going though a shoe phase and am very drawn to shopping for them. I decided to risk a pretty different style for me and actually ordered a pair of shoes online (because the return policy was very reasonable), fingers crossed they work out. I am also completely in love with a pair of Valentino pumps with a low block heel and ankle-strap, but they're hardly available anywhere it seems - http://www.stylebop.com/sg/product_details.php?id=352701 - but I hope not to spend that kind of money on shoes as I am pretty hard on mine. I had to bid goodbye to an old favourite linen dress because it's getting too sheer and worn to be decent, so hope to find a replacement, but that's unlikely seeing as all the shops are moving to fall and winter clothing already. Oh well. Ooooow, I love the idea of this leather skirt w/croc embossing as a foil for the rest of the feminine, sweet tops you have picked out. Genius! I love how considered your list is, as you reflect on what you have and what you are missing. I'm heading into summer so my focus is more on lighter pieces, although in all honesty I'd say it's probably complete. LOVE the leather mini by the way. That's a must have! Nice selection. I also have eyes on the Boy shirt and saw a similar Gap version yesterday that is more budget friendly. Fall is one of my favourite season and I got covered most of the basics though I would "need" a new jacket... But the plan is to remain focused shopping wise. I have Didion on the brain too! Such classic style. Love your selection especially the leather skirt. I have an A line one and I get so much wear out of it in the winter. Always on the look out for another one. The BOY by Band of Outsiders shirt is beautiful too. I love everything Scott Sternberg designs! I start my first full-time job in September (I'm a newly qualified teacher) so I want to use some of the money I earn to buy long-lasting, 'big' items. So far (out of necessity) I'm dead set on a coat - something oversized, soft and classic that I can wear for smart or casual, a pair of boots (probably ankle with a chunky heel) and a brown leather wallet (probably a Mulberry). Apart from these essentials, I'd like a very masculine pair of brogues, a cream jumper and a big soft scarf, probably an infinity scarf. As it's my first season of actually having an income after years of being a student, I also have a lot of debt to start paying off and lots of changes to make in the way that I pay household bills, so how much of this list is fulfilled to a high quality remains to be seen! Your picks are great and love reading everyone else's. I'm craving some relaxed but tailored fitting leather trouser pants perhaps with a cropped, tappered leg. I would also love a pair of anthracite Dicker boots but perhaps my sole fall purchase (for now) will be the Rag n Bone moto boots. 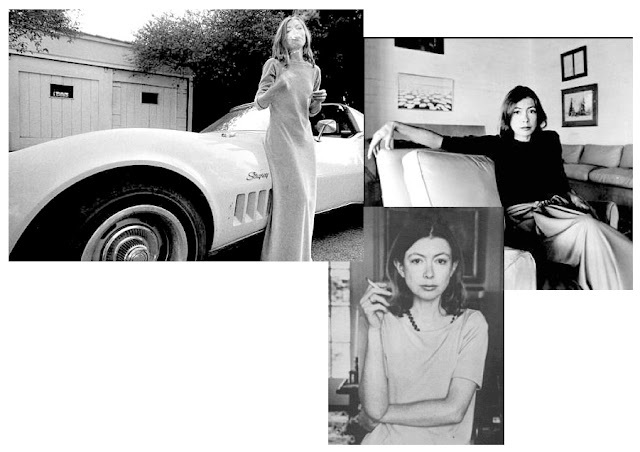 Joan Didion...so much love. Such a talented woman. There aren't very many things I want for the fall--a pair of loafers, a pair of dressy flats, a simple black blazer, and maybe some work-appropriate dresses from Steven Alan. I'd also love to get the Acne Rita leather bomber jacket, but that would be a major (and majorly irresponsible) splurge. By the way, that leather mini is beyond hot! I bet you would look awesome in that! I don't have anything in mind! I know, how weird! That said, I do not think the PS1 is beneath you, I think it's fabulous. A lot of blouses and shirts for me this fall. Also, I've gotten a new blazer that I can't wait to pair with my clothing to create 'all-new' outfits. I'm also looking forward to bringing out my loafers and leather flats once again. Those two blouses presented above are divine! The Acne scarf has been on my wish list since last winter - have been waiting for it to get back in stock. I love the wine red version! I love the denim style shirt and the white jumper! Gorgeous!! The phrase "it's just short enough and leather enough" is my fall wardrobe plan in its entirety! ...But I suppose I should also alter the vintage suede trench coat I picked up last summer. Oh, and another pair of ankle boots and a slouchy carry-everything handbag would be very, very welcome. I'm also looking for a nice cream sweater as a layering piece! My ideal sweater would be 100% cotton, cable-knit (or some other nice textured knit) with an o-neck and a nice strong hem. I actually spotted one at Mango this summer that would've done nicely, but now it's gone from their website :( I'm also sort of looking for a pair of dark blue jeans, a white cotton blouse, a breton top (none of them seem to have wide enough stripes for me right now) and a gray canvas skirt, but none of that is actually essential. I'm feeling much more well-sorted for fall than I have for years. Other than that, I do need to think about shoes - black chelsea boots or maybe high-top sneakers, I can't decide which. The only thing that is throwing a wrench into my plans is the fact that I'm invited to a wedding in northern Germany this October. The only dress I own is black, and I have NO appropriate shoes for weather that could already be disastrously wet and cold. Oh well, I was going to try and find a cute green dress anyway. The leather mini looks sooo good! And it was so devastating to read about your Manolo situation! I keep my fingers crossed that it resolves with the least damage to you. As surprising it may sound - I have nothing on my fall wish list. Maybe only Church oxfords. ;) For me in a way I can't wait to wear all my fall favorites - camel blazers, trench coat, brogues. And I definitely need to read Joan Didion!